StaxRip how to make divx-home certified stream with xvid encraw? I found this document that explain the limits of each profile of divx certified logo. I want to make compliant AVI using staxrip and xvidencraw, with the best settings possible. Is the right way to proceed ?! Wow... Out of interest, what's the make and model of your hardware player? Not for me. For friends and people that has old panasonic\lg or systems like integrated tv and projector with usb that can't reproduce anything else than avi-divxhome. For now, i kept a WinXP machine for doing the job using the lastest DivX codec 6.8.5 and old staxrip, but now i upgraded to win10 and i want a more simple integrated and flawless workflow. Staxrip accomplish my needs very well but new version doesn't have vfw (so divx) anymore. Last edited by martynuzza; 17th September 2018 at 19:34. If the old gear can handle 'ASP' (Advanced Simple Profile) encodes with b-frames, try generating encodes with one (not two or more consecutive) b-frames(s). And select the 'Packed bit-stream' option. Macroblock rate [Mbs/sec] = Resolution/(macroblock dimension)*frame rate. 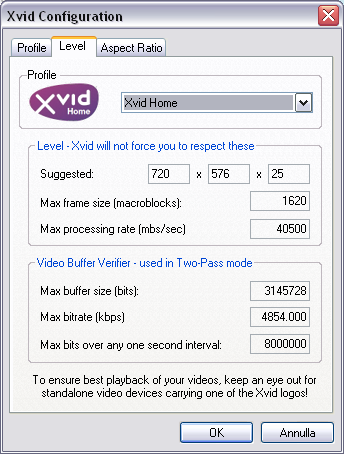 For Xvid/Divx Home profile (up to) 40500 mbs/sec = (720*576)/(16*16)*25 for PAL videos; (720*480)/(16*16)*30 for NTSC videos. vbvpeak is "Max bits over any one second interval" in Xvid interface (your posted image). For Home Profile, it's "8000000" (not 40500). I'm not sure, but vbvpeak is not very important (is for codec internal check only) and in official MPEG-4 SP/ASP profiles is absent. VBVpeak is satisfied already with others vbv parameters: Max bitrate and Buffer size of Home profile. In Divx Profiles table in your post, matrix for Home Teather is, theoretically, h.263 only, but you can to use MPEG matrix too, "standard" (not "custom"). MPEG standard and H.263 are fully Standalone player compatible. Note: That table I think is not fully correct: example: VBV size of HD 720p profile is not 2048 kB (this is for 1080p only); actually it is 768 kB (9708 kbps double bitrate of HT profile... so must be double size of HT vbv size too ) In Xvid interface all these values are correct for 'equivalents' DivX profiles too. XviD VFW interface keep no restriction on that but should do so. I remember that the bitstream should to be, instead, packed and with only 1 b-frame allowed at maximum. I tried a sample conversion with DivX Converter with codec 6.8.5 and him makes a packed bitstream...so this should be the correct way. If the playback devices are only able to support MPEG-4 SP/ASP streams with b-frames placed within the .avi container, ideally you will need to use 'pack bit-stream'. However, if the playback devices are able to support MPEG-4 SP/ASP streams with b-frames placed within the .mp4 container, you wont need to use 'pack bit-stream'. If you haven't done-so already, try creating some short .avi and .mp4 test sample files. It's true for DivX Home profile full compatibility. 1 b-frame + Packed Bitsream is safest choice. Every old Standalone Player support 2 consecutive b-frame too, but the problem is combination of 2 b-frames with (or without) Packed Bitstream. Almost all support 2 B-frame without PB; others support 2 B-frame but with PB. Last edited by blob2500; 20th September 2018 at 01:47. He's retired, I think I'm the only one who has added functions to the code since. Doesn't the help function enable when you click on it? For example, bitrate at 1800kbps, is correct the syntax? Last edited by martynuzza; 20th September 2018 at 15:17. It's been ages since I actually used XviD, I'm a bit rusty when using XviD. Only the second pass requires the -avi and .avi file location output. The encoder will pull in the .pass file which contains all the needed information. First pass writes to .pass and second pass reads the .pass. You can also use ffmpeg XviD as well, with does most of the work for you already. It has 2-pass mode built in and will add the proper flags for the passes. Last edited by Revan654; 20th September 2018 at 19:43. StaxRip already uses 1.3.5, If you have 1.3.3 you must have downloaded a older build of StaxRip. I found MeGui way to limited, when it comes to filters & Encoding. After all these years x64 version is still listed as a test build. Hybrid & StaxRip were always my go to Encoders. I mainly use Hybrid on Linux(One few Encoders that's fully support in Linux). With StaxRip being my Main Windows Encoder. Last edited by Revan654; 25th September 2018 at 19:45.